You WILL have a merry Christmas! What is your favorite Geek Holiday memory (the best geeky gift you have ever either given or received, a cool geek-themed holiday gathering, etc.)? In return, if you wish you can ask me any question you like about whatever you like, which I will answer either completely truthfully or not at all (in which case you can ask something else). You don't have to ask me anything if you don't want, but I'd still like to hear your answer to the question. 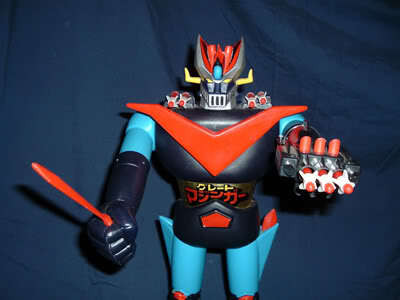 One year when I was a kid I got this big plastic Japanese robot called Mazinga that had a ship docked in its head and missiles that fired out of its hand. I had seen very little anime and didn't know who the heck Mazinga was, but he was cool. I had that thing forever and got a lot of enjoyment out of it. No questions from me this time Jeff, just happy holiday wishes to the best bunch of internet people I know! Dan, I remember poring over the Sears Catalog for HOURS leading up to Christmas, circling the Star Wars figures I wanted. They were great because it was one of the few places you could find pictures of them all in one place. The major problem with the actual toys, of course, was their lack of movement — you could only rotate the shoulders, head, and hips and those only in one plane. Lame. The MEGO 8″ action figures were way more posable and fun, but … they didn’t have light sabers. I always wished they’d do the Star Wars figures the same way. Oh wow, I forgot about the Sears catalog! I did the same thing. I remember getting it and just flipping through the thing looking for the toy section. Remember how when a new line was coming out they’d show them blacked out, so you’d sit there staring at them just trying to imagine what they were going to be? Holy reindeer droppings on a stick! My brother and I got those Shogun warrior dudes wne year for Christmas! He got Mazinga, and I got Raydeen. Yeah, I’m gonna have to go with the crowd on this one; the Star Wars Christmas; Action figures, Speeders, At-at. Awesome 🙂 Just about everything we got one year was Star Wars. All have a fun and safe weekend. You guys struck a nerve with those memories. Did we all secretly have the same rituals as kids? The good old days…. I’ll mention this blast from the past. No question, just a suggestion. More “sketch of the day” please! Merry Christmas to all! Cheers! A friend of mine says that all men are a*****es, so two years ago I bought her “Y: the last man”. She hasn’t read it yet, by the way. The year that my immediate and extended family got together and bought me a ton of Dungeons & Dragons action figures: Warduke and Nightmare, Strongheart, “Melf” (really? ), Elkhorn the Dwarf, Kelek the Sorceror, the Titan, and several more. Perhaps my favorite geeky Xmas gift is the Alien Legion Graphic Novel (1986). My older brother gave to me. Huge surprise because I didn't ask for it and he isn't a comics fan. Have it on display with my collection of books, CDs, and DVDs. I'm super busy this weekend with celebrations and obligations. Might not have time to sneak one in for the Character Contest. Whatever or whether you celebrate, have a fun weekend! Oh heck yeah, Atomic Punk, I bought the Alien Legion collections a couple of years ago for myself. Love ’em! I did love my Six Million Dollar Man action figure, mostly for looking through his eye via the rear-head viewport. This one’s easy for me. I was about 13 when the original Star Wars came out the first time, and of course I fell head over heels in love with that movie, like everybody else in America who saw it. That Christmas, my Mom found lightsabers for me and my nephew (who was only a few years younger than me and who was living with us at the time), but I digress. These lightsabers were just flashlights with plastic tubes on the end. I think they were actually called something besides lightsabers because they were unlicensed knockoffs. My Mom had to hide them at my grandmother’s house next door because she had no way to box them or wrap them. How can you wrap a flashlight with a tube on the end of it? She waited until my nephew and I went to bed on Christmas Eve and sent my older brothers over to my grandmother’s house to get the lightsabers. My brothers proceeded to have a lightsaber fight in the snow. We absolutely loved those things and played with them until they fell apart. Oh, Jeff. BTW, if I use another browser besides Firefox, I can get to your blog just fine. The access issues I’ve been having must be a problem at my end. Dunno why. Two most memorable for me were my 5th birthday (11 days before Christmas)and my first Christmas with my fiance. 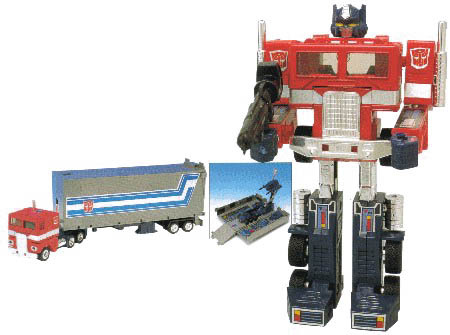 For my 5th Birthday, my dad, who was a truck driver, brought me a G1 Optimus Prime, complete with super awesome unfolding trailer missile launcher. Then, for our first Christmas, my girl found me a cast photo from “Firefly”, and got it autographed by all nine of the original cast members. Made my heart the happiest it’s been in years. @Nial Mor(11): Just out of curiosity, what IS your poison (Firefox, Opera, Safari, Chrome, IE, other)? I was 15 when the original Star Wars came out in 1977, I watched it 50 times in the theatre that summer! Often just staying in the theatre and watching it 2-3 times in a row.. Sadly I dont know what eventually happened to them, wish I still had them, although, being a pack rat, I really would have no place for them, but I would make room. But the main thing that I always remember about that year, is not only the fun I had with all the Star Wars toys, but that somehow my parents came through for me, and got me all that stuff, although we probably couldn’t really afford it. Jeff, what was the most meaningful gift from your parents? Wishing you all a Blessed and Joyful Holiday. @Joel (12): All nine? Wow, that’s cool (and geeky). Oh, and my question to Jeff: What’s your favorite show that no one else remembers? Oh shoot! Forgot the Diplodocus. Wow, where to start? From Mighty Max to Ninja turtles to Todd McFarlane’s Spawn franchise, I was toyed up for eternity! But, to bring the gamer side back into the conversation, I think the best two I had were the Super Nintendo and the Playstation 2. I actually still have my Super Nintendo, recently been eyeing some of the Mega Man X series titles. Vintage gaming for the win! Have a great holiday everybody! My best friend got the Death Star novel for me a few years back. I was dissappointed until I actually started reading it… One of the best Star Wars Expanded Universe novels that was not written by Timothy Zhan. What would be the best Christmas present you could ever wish for, Jeff? Cliff, my mom made an afghan blanket for me a few years ago that I love. Every time I huddle up in it over the CO winter I think of her. BenK22: Pretty much everyone remembers everything nowadays! I’ll go with “Columbo”, though, since most of the folks ’round these parts are more into geeky shows instead of obscure 70s police mysteries. Dionne Jinn, my best Christmas present would be world peace. Or to end hunger. Also, I totally would win the swimsuit competition. If videogames count, then mine would no question be several years ago (forget how many) when my parents got me a gamecube and Super Smash Bros game. It was the first time I had ever owned any for of videogame system except for a old gameboy advance and crappy dial up computer (if you can call that a videogame system). When I got it I think I might have nigh-on hyperventilated, and I think I played that pretty much all day long. Any super power? I would go with my standard “Magic Pocket” wish — I would have the ability to pull anything I like out of any receptacle I want. So if I put my hand in my pocket I could pull out a magic potion that would make me immortal at no other cost, or a wad of twenty dollar bills, or an ocelot, or anything else I like. If that doesn’t qualify as a super-power (which I can understand, but to which I would reply “Zatanna”! ), I’d go with teleportation. My favorite would be recently when my buddy Joe got me a pikachu scarf as an early Christmas present. I got him a STARS pin which he waers everyday. The second-best would be when I was a wee little hellion and my parents bought my brother and I a gamecube, Luigi’s Mansion, and the Legend of Zelda Collector’s Edition for Christmas. To this day I still have that Zelda disc, now I just play it on my Wii. On a side note, I only just recently beat Majora’s Mask. Yeah, sounds like I had a similar childhood to a lot of guys. Flipping through the toy section of the Sears catalog…that was my favorite reading material during December. Ran the gamut of geeky: Star Wars, Transformers, I remember getting a bunch of Battlestar Galactica ships one year. The edges of the Cylon Raider separated outward, revealing missile launchers that actually shot these little red missiles that I somehow managed to not lose for 6 months. Even more amazing, I don’t think I lost the little Cylon and the Viper Pilot that came with the ships until I lost track of the toys themselves. I had the Raider and the Colonial Viper engage in space battles for hours on end. Jeff, what’s at the top of your (attainable) Christmas list this year? Mine would have to be the year my parents decided we could have video games. We ( my sibling and I) got a N64 Donkey Kong Bundle Pack, along with Super Smash Bros. and a Toy Story game, then I personally got a gameboy pocket with a zelda game ( forgot which one), another donkey kong game, and Pokemon Red version. I can’t remember how many times I played that Pokemon game. I never could figure out the Zelda game, though. Years later I found a walk through online and finally beat the game. Jeff – Ah yes, I have several hand crochet afghans from vatirous family members. Brad – well if vampire/goth count as geeky, I got 2 silver hinged finger cuffs with pointed tips one year. another major geeky Christmas …. Being a perpetual kid to this day, in 1988 I was 26 and I loved the Brave Starr cartoon from Filmation. My friend Brenda, who would in the next year become my wife, bought me Brave Starr, Fuzz, Handle bar, the Stage Coach, Tex Hex, his Skullwalker, Sand storm, and the Fort Kerium Playset. I also got a plastic snitch, and a furry Monster Book of Mosters, that purred and vibrated when you pulled his tongue. Jeff, imagine if, on Christmas Day, you’re in your backyard where a strange meteor has just crashed. Inside the crater, what would you rather find– A). Mister Mxyzptlk emerges and promises you the powers of Superman for a year? or B). A Green Lantern ring selects you to be the newest Green Lantern for a lifetime, but you can only stay on Earth three months out of every year? Myro, we already got each other a new bed set for our holiday gift, so nothing more coming down the pike, alas. We’re trying to save money for a rainy day instead. Joshua, I’d go GL in a heartbeat. Mr. Myx is a jerk and would probably do something horrible to me in exchange for the powers. As opposed to nine months of exploring the known galaxy?! Hell yeahs! Jeff are you working on, or did you see my request for a predator mask or army of two mask from the martial artist contest I won a while back? TOOL, yes, it’s on the list. Most of my geekier presents I seem to remember getting on birthdays for some reason. But one Christmas a few years ago, one of my favourite presents was a Dalek Sec toy that I probably ended up playing with all day. One that’s a definite contender for ‘favourite’ though would be a 12-inch radio-controlled dalek. I’m not sure about when I got them but I really loved them but I did have a VHS boxset of the Star Wars original trilogy and a Thunderbirds video that for some reason I got rid of. I’ve no idea why, because I really wish I hadn’t now (my grandparents still have a video player so I could watch them up there- if I’d kept them). A consistent geeky gift is getting a Doctor Who annual pretty much every year since 2005. My favourite’s probably the 2006 one. Yeah, I really like Doctor Who. This year I’m hoping to get copies of the Allspark Almanac parts 1 and 2, as well as the works of Lewis Carrol, H.P. Lovecraft, and Jhonen Vasquez. And a My Little Pony doll. ams (31): The best part was dragging the toys out to watch BSG. I felt sorry for the rest of my family who didn’t have a Cylon Raider or Colonial Viper to play with while watching Battlestar. Jeff (34): Yeah, that’s a big purchase. I remember buying a new queen-sized mattress a couple years back, no bedframe, and just that put a big hit on the bank account. That’s too bad though, I know you were jonesing to get your hands on Skyrim last month, and I was going to suggest asking Santa for it. Top of my list this year (sadly above the geeky fun stuff) is a new hiking backpack. The old one is barely hanging on. 1984: I got every Transformer I wanted, when they were *impossible* to find in stores. I suppose compared to many Heromachinists, I’m relatively young. But the coolest geekiest gift i recieved was Assassin’s Creed 2 because I’m such a huge fan of Assassin’s Creed. Unfortunately I don’t have any cool toy stories from the 80’s like most, considering I wasn’t alive. No question. Happy Holidays to all!!! Hey it’s Tranzor Z. Voltron had it all over that thing when I was a kid. Come to think of it, still does. We celebrate “Pi Day” (3/14) and “Pi Approximation Day” (7/21) by eating pie. Unrelated sharing: We recently got a fish tank, and have named our fish after Roman mythological figures and characters from Mortal Kombat. The only other with a more unique name is our dragon fish, Alduin. 😀 Skyrim is a whole new life! Honor it! My new version of McKnight. 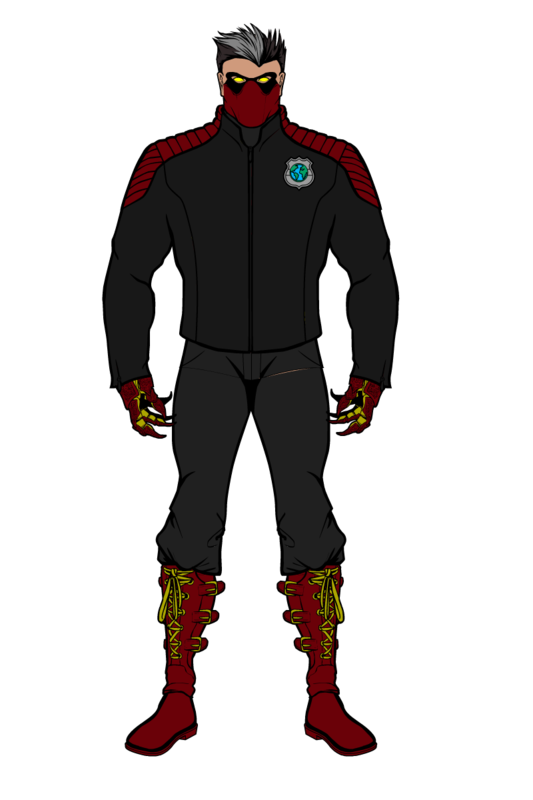 The same chest piece from the earlier version still exists, but is mostly a bullet-proof vest underneath the jacket. The geekiest gift I ever gave anyone was to my brother: A set of figurines of the original Legion of Superheroes. They were completely immobile and all about 3 inches tall (except for Colossal Boy, who was kneeling and thus about 6″), nicely painted and came in a cool display box. Chameleon Boy had a little Proty attached to his leg. Sadly, there was only one Triplicate Girl. The geekiest part of all this perhaps is that we were in our late 40s at the time. He still has it on display. Two New Year’s ago, some of my friends put on a time-travel-themed party the afternoon of New Year’s Day. We dressed in costumes (I went steampunk). We played some themed games, and we also did some LARPing, which this group of friends really enjoys. The way we do the role-plays, the guy running it hands out sheets asking us questions about our character. Some of the questions clue us in just a bit on the plot, but not a lot. So then, we start trying to act out our roles. The guy leading it at various points announces decisions that each of us or the whole group has to make. Sometimes, depending on the decision, we have to perform some kind of feat to determine whether we succeeded or failed. It may be moving one block in a Jenga tower, it may be successfully adding a magnet to this one game where you place magnetic balls in hopes they don’t attract each other. Your success or failure determines the direction of the plot. When the game ends–when we’ve all died or whatever else is the aim of the story, the guy leading the game reveals all the bits of the story we were trying to figure out along the way.